To protect a vulnerable gull nesting colony for research purposes. Physical: Fraser Lake, about 50 km2 in size, drains eastward into the Nechako River. Ellis Island, 600 m from its southern shore, is low and egg-shaped. Much of the surface of this heavily glaciated island is bare rock; where soils are developed they are Regosols. Biological: The major feature of this reserve is its nesting colony of Herring and Ring-billed gulls. The island is one of only two Ring-billed Gull colonies in the province. This species did not begin nesting here until 1985, when 24 nests were counted. A few pairs of Herring Gulls began nesting about 1958, and increased to 15-20 pairs by the late 1970s. 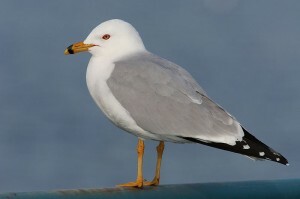 Adult Herring Gulls arrive in April and lay and incubate one to six eggs in May and early June. The young hatch in June after 25 to 28 days of incubation, and spend about 45 days as fledglings. Ring-billed Gulls have roughly similar characteristics and phenology, but a shorter fledgling period of 37 days. Young gulls may be present until mid-August. Common Loons, Mallards, Northern Pintails, Spotted Sandpipers and Common Crows also nest on the island. Other birds seen there, some of which probably nest, include the Rufous Hummingbird, Tree Swallow, Orange-crowned Warbler, Yellow-rumped Warbler, Wilson’s Warbler, Savannah Sparrow and Ruddy Turnstone. Scrubby aspen-cottonwood stands with a dense understory of red-osier dogwood, willows, prickly rose and black gooseberry occupy moist to mesic sites having the deepest soils on the island. Dense rose-red raspberry thickets occur slightly above and adjacent to the aspen stands. The shallowest soils have a rough fescue-bluegrass community which contains several species of forbs. Much of the island has a surface of bare rock supporting lichens, mosses and spreading stonecrop. Most of the gull nests are on rocky sites on the northwest part of the island. Warming water temperatures may alter the nutrient cycling process of the lake, changing the aquatic community composition and possibly vicariously impacting the gull populations. Changes to the water levels due to altered hydrology may also affect the gull populations and their nesting habitat. Recreation: Marine vessels (both motorized and not) may impact the Gull populations.